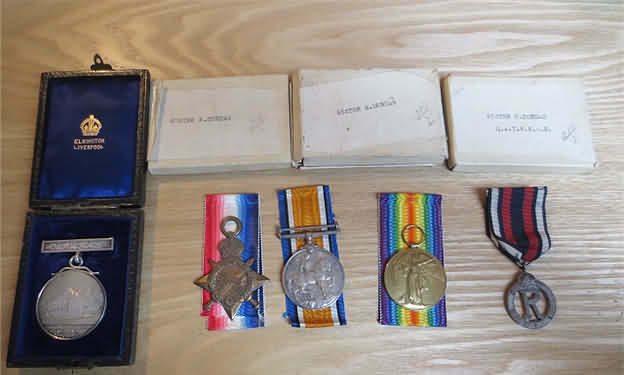 Agnes’s medals (note engraved with her middle initial E). Emily’s Army Nursing records survived the post World War One cull, including her application form which she signed ‘Emily Dundas’, and gave her training details.13. In July 1919 A report is written for the Medical Officer of Health in Bootle, where Emily may have been applying for a job, which whilst accurate may not have helped her get the job; ‘Her work in the Army gave no opportunity of judging whether or not she was suited to nurse women and children’16 It appears Emily who had served for five years in very challenging situations was applying for other work. Whilst accurate, the reference is perhaps unfortunate in its brevity. 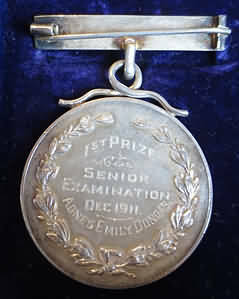 Emily registered as a nurse on 25th October 1923, her registration number 13434, and her registered address was in Waterloo; it is thought that she worked as a ships nurse on SS Montclare, a passenger ship built for the Canadian Pacific Steam Ship company.19 Between March 1922 and December 1938 Emily made over 13 crossings as a nursing member of the Ship’s Crew.31 A crew card for Emily, dated 1936 records that she has blue eyes, brown to grey hair, a fair complexion and is 5ft 7inches tall. Her date of birth is found on other records; possibly to gain employment, although this varies from card to card.32 Similarly her job description varies from Nurse to a combined title of ‘Masseuse Nurse’.33 Bessie Dundas, her sister, also travels to Canada on at least two occasions, once in 1922 as a passenger on the Montclare.34 It is thought that they travel to see their brother James who appears to have lived in Quebec from at least 1920, where he was working as a railway officer.20 Aged 60 years Emily withdrew from the nurses register in October 1944, and died in Anglesey in 1965, five years after her sister Bessie with whom she shared a cottage, died there also.21 Bessie left her estate to her sisters Emily and Marion, a widow.22 Marion died in Chichester in 1988 aged 93, a few miles from where these medals were auctioned.23 It has not yet been possible to locate any living descendants of theirs. Bessie also served during World war One, but suffered from Neurasthenia; ‘Shell shock’, and was invalided out after one years’ service. 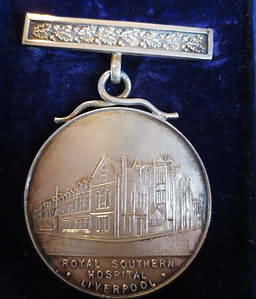 Bessie served as a member of the TFNS at 1st Western General Hospital, Fazakerley, Liverpool from 1914 to October 1915, when she was invalided out. ‘Major Rundle reports that Nurse Bessie Dundas is apparently suffering from a condition of nervous debility associated with a mitral stenosis.36 She had also had a DVT one year previously, which caused much pain in the affected leg, and was reported to be depressed. Bessie received a gratuity of £9.0.9, equivalent to £389.15 in 2005.37 Bessie’s service record fails to document where she trained; the remaining papers concentrate on her ill health; Bessie was ‘lucky’ in that she did receive a small gratuity, many nurses failed to do so for similar and equally debilitating diseases. 2. TNA, the England and Wales Censuses for 1911 accessed via Ancestry.co.uk, 3rd January 2015. 4. TNA, the England and Wales Censuses for 1911 accessed via Ancestry.co.uk, 3rd January 2015. 5. Master's Certificates. Greenwich, London, UK: National Maritime Museum, accessed via ancetsry.co.uk 3rd January 2014. 6. TNA, WO/399/2407, Miss Agnes Emily Dundas; Overseas death registers accessed via Find My Past, 5th January 2014. 8. TNA, WO/399/2407, Miss Agnes Emily Dundas. 9. TNA, WO/399/2407, Miss Agnes Emily Dundas. 10. TNA, WO/399/2407, Miss Agnes Emily Dundas. 11. TNA, WO/399/2407, Miss Agnes Emily Dundas. 12. RCN Archives; The British Journal of Nursing July 6th 1918. 13. TNA, WO/399/2407, Miss Agnes Emily Dundas. 14. TNA, WO/399/2407, Miss Agnes Emily Dundas. 15. TNA, WO/399/2407, Miss Agnes Emily Dundas. 16. TNA, WO/399/2407, Miss Agnes Emily Dundas. 17. TNA, WO/399/2407, Miss Agnes Emily Dundas. 18. TNA, WO/399/2407, Miss Agnes Emily Dundas. 20. Ancestry.co.uk, accessed on 3rd January 2015. 22. Probate Registers for England and WalesAncestry.co.uk, accessed on 3rd January 2015. 23. Free BMD, death registers, accessed 3rd January 2015. 24. Y. McEwen, ‘In The Company Of Nurses’, Edinburgh, 2014, pp 93, 99. 25. Y. McEwen, ‘In The Company Of Nurses’, p 99. 26. Dame E Oram writing in ‘Reminiscent Sketches 1914-1919’. London 1922, p 35. 27. Dame E Oram writing in ‘Reminiscent Sketches 1914-1919’. pp 39-40. 28. Hospital and Newspapers in the Liverpool Archives might yield some information. 30. TNA MSEA_BT348_34_78_347874.jpg, Crew listings accessed via Find My Past.co.uk, accessed 5th January 2015. 35. Y. McEwen, ‘In The Company Of Nurses’, p102. 36. TNA WO399/10965, Dundas, Bessie. 37. http://www.nationalarchives.gov.uk/currency convertor, accessed 5th January 2015. Many thanks to Sylvia and Will. Copyright, Sarah Rogers 4th January 2015.